AffairAlert.com claims to be a different online dating site, unlike other online dating sites. They promise to provide you all the tools to find the hottest and most compatible partners for a hot affair. But, there is a great catch. 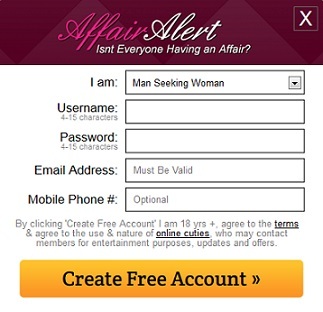 Although their promise may be true in some isolated cases, AffairAlert.com simply has too many fake dating profiles. That’s right! This site uses fake women to scam people. We invite you to continue reading to find out how you may be getting scammed, and why you should warn your friends too. Everything listed in the section above is truly offered to you. But, of course there is a catch. Let’s just say that you need to read the terms and conditions of service of AffairAlert.com before you join it. By now, we reviewed the features this website offers and how much it will cost you to use these services. Let’s go back to the ‘Terms of Service’ that you can find at the bottom of the homepage of AffairAlert.com. Did you know you have agreed to them when you were setting up your account? Automatic email messages to get you to update to a paid subscription just to be able to read the message. Messages that are absolutely computer-generated and you are not even communicating with real people. Fictitious dating profiles called “Online Cuties”, created by the website to make you think there are many people you can connect with. Even if happen to communicate with a real person, they are most likely to be hired and paid to chat you up and keep you paying for monthly subscriptions.